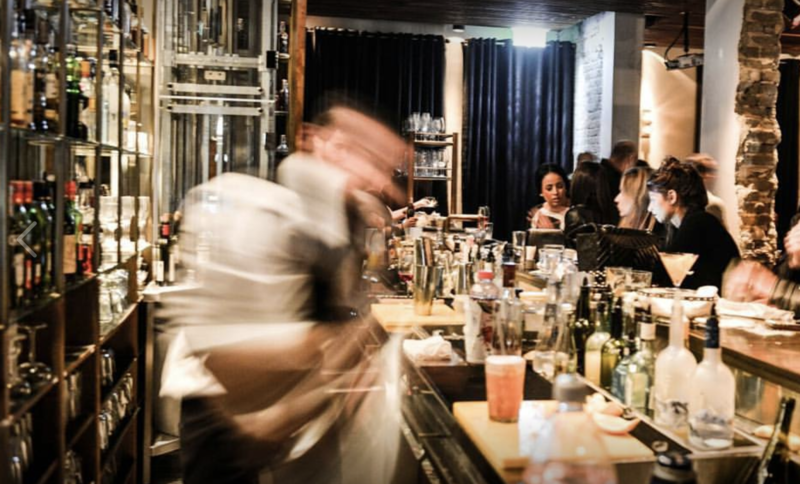 People often ask us for recommendations for a fun boozy dinner. In fact, it’s probably one of the questions we get asked the most. So, for the next chapter in our “Top 5” series, we’ve decided to make an official list of the best places to go out, eat good food, and then forget all about it. This trendy spot at the bottom of Rothschild is buzzing at all times of the day. It is one of our favourite places for midday cocktails on a sunny summer’s day! Rothschild 12 offer a great wine selection and we love to take advantage of the 1+1 happy hour deal that they offer between the hours of 17:00-20:00 everyday. All the food is excellent, whether it be their brunch, lunch or dinner menu. Lets be honest, we didn’t expect otherwise from the R2M Corporation! In the evening the atmosphere changes. If you are after a more relaxing night, we recommend reserving a table on the terrace- which is probably the number 1 people-watching spot in the city. For those after a slightly more upbeat, “party” atmosphere, inside you will find live performers and DJs depending on the day. Click here to see the daily line up. 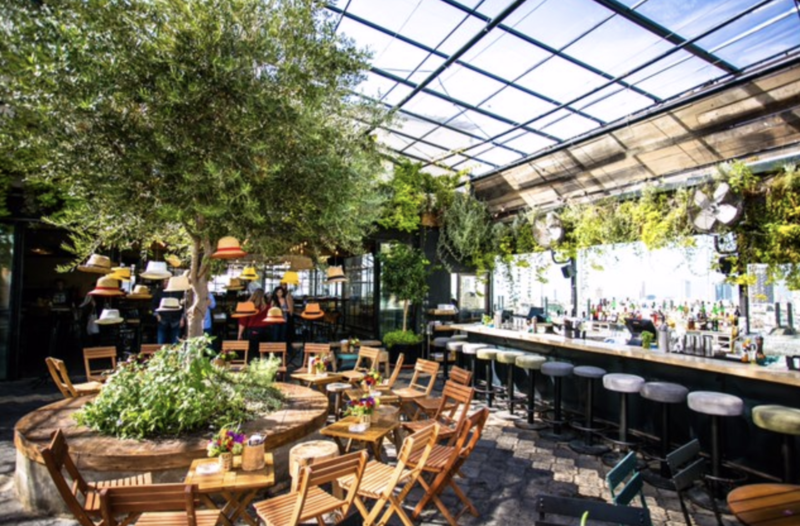 Located on the 10th floor, with breathtaking views of the Tel Aviv skyline, we highly recommend giving this rooftop bar a try. After entering the bar through a grotty underground car park we were pretty taken back by the decor and “New York” vibe to the place. This is definitely going to be a summer hot spot for both the locals and tourists. They have a delicious selection of easy-to-eat food like pizza, fried calamari and vegetable chips. 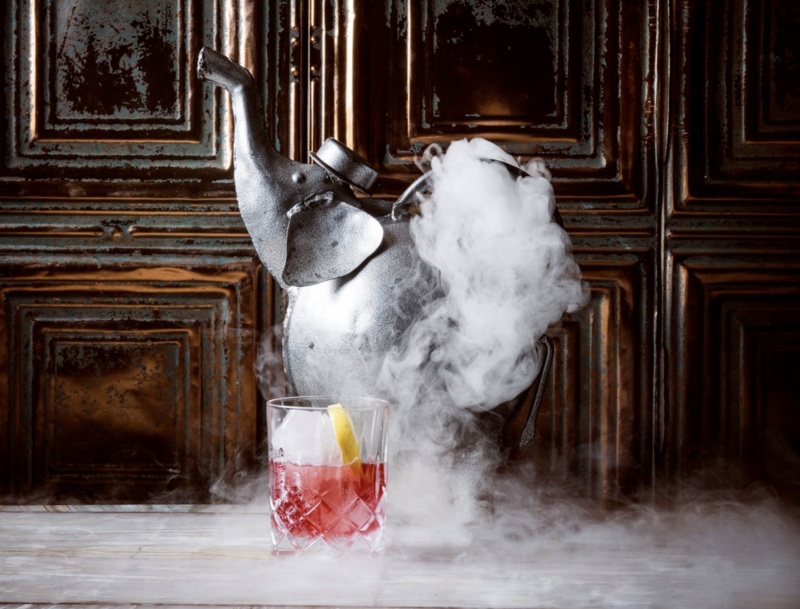 The creative cocktails are absolutely heavenly- our personal favourites are the “Jerusalem Boulevard” and the “Charlie Chaplin.” Prices are surprisingly reasonable, expect to pay around 150NIS for a cocktail and dinner. There is no phone number, and bookings can not be made other than through a connection. Check out their Facebook page here. This gorgeous rustic building is located on Yehuda HaLevi on the crossing of Nachalat Binyamin. It is separated into 2 floors: the upstairs is a formal restaurant, whilst downstairs is a trendy dimly-lit bar. The food is really exquisite and the cocktails are fantastic. When sharing the dishes, the prices can add up, so check out their sharing menu which includes 7 dishes and 2 deserts for 128 NIS per person. They offer the same menu both upstairs and downstairs but if you are after a fun boozy dinner we recommend taking advantage of the bar. 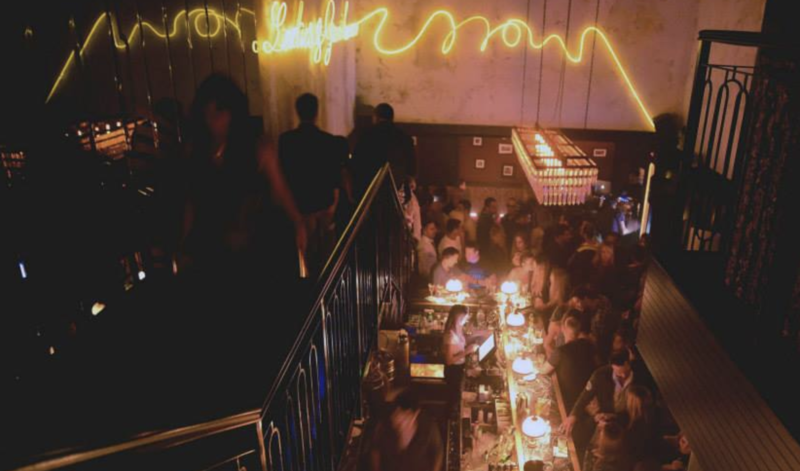 Certain evenings they have live music and on other nights you will find DJs playing deep house style music. Each option has its charm but click here for their schedule so you know what to expect. This cocktail bar is in a league of its own. Located in the Berdichevsky boutique hotel Bellboy claims to “redefine the bar experience.” Their cocktail menu is sure to impress you, and they definitely take presentation to a whole new level. You may find your cocktail served to you in a bubble bath with a rubber duck, or perhaps in a large sea shell. Creativity sure is the name of the game! Each cocktail costs around 50NIS however they offer a special deal of 220NIS a person for 5 cocktails and several small dishes. The vibes are great, the food is excellent and the drinks are heavenly- need I say more?! We recommend making a reservation as the place is very small. A 1920’s New York style bar with an Asian fusion menu might sound like a strange combination, but it works. 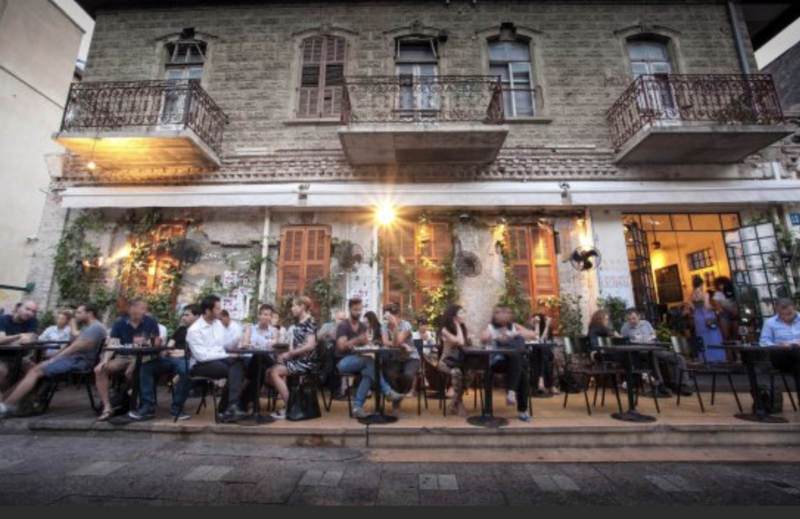 Located on Ben Yehuda, this is an incredibly popular hangout amongst the “cool kids” of Tel Aviv. Live singers and musicians play inside whilst there is a great outside terrace for those after a more relaxing, low key night. They serve high standard bar food and the “Gini Hendricks” cocktail is a personal favourite. If you have any recommendations, please let us know what you think in the comment section below! I have three days in Tel Aviv. That means three lunches and dinners. Can you please recommend the best restaurants happening today. Who should I visit? I am a foodie.